Sometimes all it takes to draw me to a book is a subtitle. 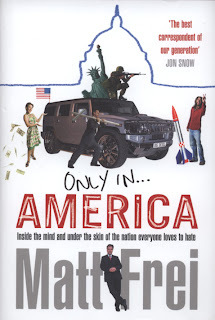 I saw Matt Frei's Only in America: Inside the mind and under the skin of the nation everyone loves to hate and simply couldn't resist. Quite a mouthful, isn't it? But it is also a 100% accurate observation of the present reality. We (in this case, 'we' roughly equals 'Europeans') simply adore bitching about the US. It is a trendy pastime, if a tad incorrect politically. Blue jeans have lost their enchanting power, now it's McDonald's, Iraq and monstrous income inequality (to name the first three things I can think of) that spring to mind when America is mentioned. Admitting as much on a book cover is pleasantly refreshing. The book itself does not disappoint either. Only in America is an engaging, mildly amusing and pretty lively picture of the country as seen through the eyes of a resident Brit. Mind you, Matt Frei is not just any Brit. As a BBC correspondent, he can get to where you or I could never aspire to enter. The White House, for example. Perhaps inevitably, a lot of space is given to studying American political theatre and power struggles that are part of the package. Not exactly a crowd pleaser as far as subjects go, but Frei has the gift of writing about politics without actually boring the reader to death. Other topics include the weather (no, don't yawn - hurricanes aren't dull), immigration and philanthropy. Then there are snapshots of 'ordinary' life as experienced by a foreign resident in Washington DC, father of four. Despite the provocative subtitle, Only in America actually presents a very kind view of the last superpower standing. No hatred whatsoever can be detected in Frei's words. Bewilderment, yes, amazement, sometimes healthy scepticism, but you can tell he kinda likes it there. One warning - double check any figures. I'm sure it's just a silly mistake, but on page 158 you can read that United States are home to one-fifth of the global population. Ouch.